Thieves interesting name derives from the fact that it was created based on research about four thieves who during the 15th-century plague, used cloves, rosemary, and other aromatics to protect themselves while robbing plague victims. This Cleaner comes in (2) sizes 14.4 oz and 64 oz. 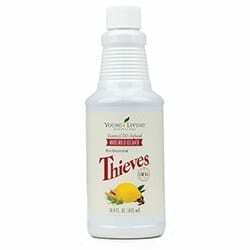 Thieves Household Cleaner is formulated with the power of Young Living’s Thieves essential oil blend. It is a concentrated, versatile solution that gives you a deep clean when scrubbing, degreasing, spot cleaning, dusting, and more. NO harsh chemicals, only a spicy-sweet aroma and plant-based formula. Suggested dilution ratios are included on the label. Before cleaning upholstery, fabric or carpet, perform a spot test with the Thieves® Household Cleaner in an inconspicuous area. Shake bottle before using for maximum benefit. Not recommended for internal consumption. Keep out of reach of children. Store away from excessive heat and direct sunlight. For the “All Natural Home”: THhieves Houehold Cleaner helps you stay within your budget! One capful = 1/2 TBSP Thieves Household Cleaner costs 37 cents per capful wholesale. Clove essential oil, 15 ml. Cardamom Vitality oil, 5 ml.